A good developer is always looking to improve a course offering. Before the course goes out, we may run a pilot or find some testers to give us feedback and look for errors. However, there is no better feedback you can get than from the learners who take the course themselves. They are some of the most qualified responders to tell you if the course is adequate for their job role and whether or not the course was easy and intuitive to follow. For this reason surveys can be a great tool to gather feedback to be used to improve future courses. Many learning management systems provide a way to administer surveys. However, you may find these surveys are not adequate or your project may not even involve an LMS. In this tutorial, I'm going to show you how to embed a survey created in Google Docs into a Lectora project. 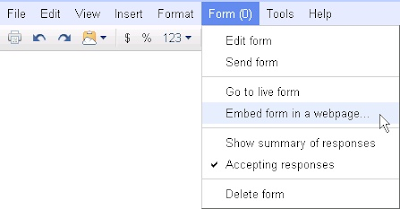 You can learn how to create a Google Survey in Google Docs Help section (creating forms from spreadsheets) or simply search for "How to create a Google Survey". For this tutorial I'm assuming the survey is created and ready to go. First go into Google Docs and get the HTML embedding code for your survey. To do this, open the spreadsheet for the survey you have created. Go to the Form(0) menu and choose Embed form on a webpage.... A pop-up box will appear with a field labeled Paste this into your blog or website:. Copy that code and place it to the side for now. We will be using this code in our Lectora project. Next, create a new page in your Lectora project. You will use this page to embed the survey. Add an External HTML object to the page using the menu Add > Object > External HTML. 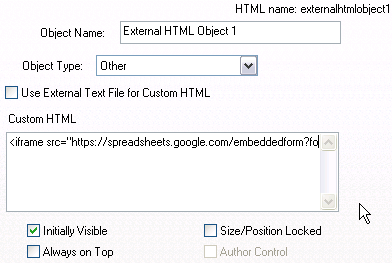 Make sure the object type is set to Other and then paste the HTML code your copied from Google Docs into the Custom HTML text box. Click the Apply button. An external HTML object will not show up in the normal Lectora preview mode. You will need to use the Preview in Browser functionality (keyboard shortcut F9). When previewing, notice that the survey is displaying. However, you may want to adjust some of the properties in the survey to make it fit in your project better. You can do this by editing the iframe code in the Custom HTML field for the External HTML object. Notice I've changed the height to 500 so that the survey will fit nicely into my Lectora page. That's it. You now have integrated Lectora with Google Docs. As learners start to fill out the survey you will start to see the data automatically entered into your Google spreadsheet. In a future post, I will show you how to pass variables such as the learner name, course completion date, or course name from your Lectora project to the survey. Thank you jonathan for your wonderful information about e-Learning Google docs...now we have some idea on it. Thank you for this explanation. I have had a problem with this and was not sure what to do. So simple!